Posted March 24th, 2019 by Mike Boyes & filed under Adult Development and Aging, Child Development, Cultural Variation, Early Social and Emotional development, Families and Peers, Human Development, Social Psychology, The Self. Description: You cannot have missed at least some of the range of stories regarding the amount of screen time children are spending and the concerns being raised about its possible impact on their development. We should be concerned but we should also be cautious about treating screen time like this month’s Tickle me Elmo, Furby, or whatever is more recently and passingly popular. We most certainly need to look at the impact of screen time and on screen-contents on the development of children and adolescents of all ages. However, especially with the sort of vast scale socio-historical technological changes associated with things like the internet and the ubiquity of screen in out lives, we need to step back from time to time and look at a bigger picture of screen time or whatever else we are concerned about. How to do that? Well, first do not restrict your thinking to children and child development alone. While that might be one of the points of greatest impact, we need to think about what screen time might represent more broadly. What might this involve? Well think about two things: First, how might screen time issues impact the elderly? And second, who is working VERY hard to reduce or eliminate screen time in their young children’s lives? Think about those questions for a moment or two and then read the article linked below and find out who Sox is (in relation to question one) and WWSJD (what Steve Jobs would do). Source: Human Contact is Now a Luxury Good, Nellie Bowles, News Analysis, The New York Times. Well, what do you think now? 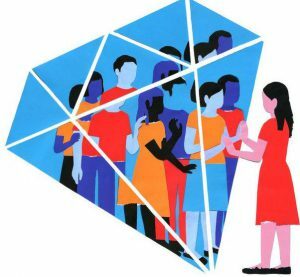 If “real” human contact is only for the wealthy and if we as a species (and the young of our species in particular) have evolved to grow, develop and rely on direct social contact then where will we be developmentally when screen time replaces social contact with real people (not Sox or even Facetime)? Understanding the differences and trade-offs between Sox and human and community contact could turn out to be one of the most important lifespan developmental tasks of our time. So, what research do we need to do? Is Sox a good thing? What might it mean that very well-off parents who made or are making their fortunes in Silicon Valley are working hard to reduce or eliminate screen time in their children’s lives? What other areas of interest, concern and needed research in relation to the wholesale jump in the amount of screen-time in people’s lives can you think of ?